According to a study published in Genes and Development yesterday, a research team at the Salk Institute for Biological studies has been able to regenerate a wing in a chick embryo. This new study adds to the evidence that mammals can also regrow limbs (see Lab Mice Unexpectedly Regenerate Limbs, Organs), an ability once thought to be restricted to certain amphibians and lizards. The new study demonstrates that even mammalian vertibrate regeneration is under control of the Wnt signaling system. "In this simple experiment, we removed part of the chick embryo's wing, activated Wnt signaling, and got the whole limb back - a beautiful and perfect wing," said the lead author, Juan Carlos Izpisúa Belmonte, Ph.D., a professor in the Gene Expression Laboratory. "By changing the expression of a few genes, you can change the ability of a vertebrate to regenerate their limbs, rebuilding blood vessels, bone, muscles, and skin - everything that is needed." This new discovery "opens up an entirely new area of research," Belmonte says. "Even though certain animals have lost their ability to regenerate limbs during evolution, conserved genetic machinery may still be present, and can be put to work again." The Wnt signaling pathway is a complex network of proteins most well known for their roles in embryogenesis and cancer, but also involved in normal physiological processes in adult animals. The name Wnt was coined as a combination of 'Wg' (wingless) and 'Int.' 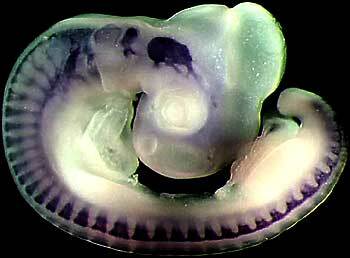 The wingless gene had originally been identified as a segment polarity gene in Drosophila melanogaster that functions during embryogenesis. and also during adult limb formation during metamorphosisz. The Int genes were originally identified as vertebrate genes near several integration sites of mouse mammary tumor virus (MMTV). To manipulate animals' regeneration ability, the Salk researchers used inhibitory and excitatory factors for Wnt signaling, which they delivered directly to the remaining bulge after they cut a limb from the experimental embryos. "The [exitatory Wnt] signal restarted the process, and genes that were involved in the initial development of the limb were turned back on," Belmonte says. "It is simply amazing." Researchers noted that the procedure must be done in an extremely controlled way; uncontrolled cell proliferation can lead to cancer. Read more about Wnt reactivates dormant limb regeneration program and this article on the Wnt signaling pathway.